White Pond and Walden are great crystals on the surface of the earth, Lakes of Light. Let's protect its fragile shoreline and ecosystem. 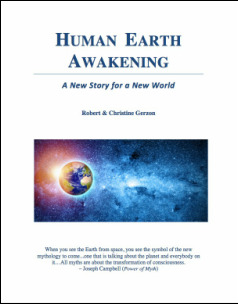 Human Earth Awakening is a mythic adventure where past, present and future collide and we have one last chance to heal our planet. It's a new story for a new world! Thanks for visiting our website. We welcome your feedback. You can contact us here or visit us on Facebook. White Pond experienced four algae blooms during the fall of 2016. For more information , please click here to read the article published in the Concord Journal. In 2017 season, there was one brief algae bloom. Warm temperatures and storm-run off combined with human and dog urine contribute to algae blooms. The preservation of White Pond continues to be a high priority for both the residents and the Town of Concord. Recent developments include these positive, concrete step to ensure the continued health of this fragile eco-system. Years of overuse and neglect combined with global warming have pushed White Pond's ecological balance past a tipping point. We've collected a helpful list of resources on pond management and toxic algae (HABs or Harmful Algal Blooms). READ the top reasons to preserve the Pond. View photos of the wildlife of the Pond. Imagine an ecologically balanced vision for White Pond. In his eye-opening book Walden Warming, Boston University biologist Richard Primack concludes, "The effects of climate change are already here in Concord, right now." How will our generation respond? ​SEE White Pond on Channel Five's Chronicle program What's not to Lake? There is no swimming allowed at Sachem's Cove. The Select Board of Concord has voted to ban all swimming at Sachem's Cove which does not have any swimming facilities- restrooms, trash bins, life guards, first aide or a parking area. This land is conservation land and people are welcome here to fish, walk and enjoy nature. All dogs must be on a leash. If you would like to swim in White Pond, you can do so at the White Pond Beach as long as you have a pass. The Concord Recreation Department will be managing the beach. For further information about a season or day pass for residents and non-residents, please click here and see page 24. White Pond Associates has donated 18 acres of waterfront property as conservation and recreation land to the town of Concord. This donation means that the town will now be managing the swimming area. As stewards of this unique property, the town plans to upgrade walkways and the restrooms while ensuring easier access for all. The town will also continue to monitor erosion control so that storm-run off does not end up in the pristine waters of the pond. ​If you would like to read more about how the town plans to upgrade the waterfront, please visit the town website here for the latest information. The town of Sudbury recently approved a housing development near White Pond of 274 units. There are currently no plans by the town of Sudbury or the developer to assess the impact of this development on White Pond. 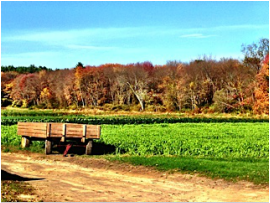 The WPAC submitted their recommendations to the Select Board in their report, A Shared Future: A Comprehensive Vision for White Pond, It's Watershed and Its Neighborhoods. ​The Committee recommends that the town develop a long-term comprehensive management plan to preserve White Pond. There has been progress in that direction in the past year. A Boston Globe article on increasing levels of phosphorous at Walden Pond has major implications for White Pond. Read more by clicking on the link below. 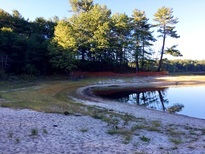 Curt Stager, the college professor who did a core sample of White Pond's sediment last summer, warns that up to half of the phosphorous at Walden Pond comes directly from human urine. Please remember never to pee in any body of water. Here is another article from the New York Times written by Curt Stager about his how human behavior affects the sediment at Walden Pond. What the Muck of Walden Pond Tells Us About Our Planet. ​The author, Curt Sager states that: Modern science has given us a much deeper understanding of our place in the natural world than Thoreau had. We ignore its lessons at our peril, because we are not separate from nature or immune to its laws. We are nature, a truth that I see most clearly through the eye of a pond. Experience the beauty of White Pond through photographs and tributes. Learn about the fascinating history of this little known part of Concord.